I found out she broke up with her boyfriend while I was on a business trip to London, so within a few days of coming home, she and I planned on having dinner and talking about what happened. Instead, we found ourselves talking over our wine about what she was going to do moving forward. Since then, she’s been embarking on a journey of trying new things, taking classes, reading books, running, and embarking on a quest to discover her true passion in life. This coming from my most “professional” friend, who networks harder than anyone I know, is a member of multiple advertising clubs, and before finding her current job as a digital marketing manager had the most intense job seeking plan I’ve ever experienced, it wasn’t something I was used to. Growing up and all the way through college, I tried to learn as much as possible and try as many new things as I could. I was part of more clubs than anyone I knew and had the most amount of internships. It was awesome to be able to say I dabbled in dance, acting, ultimate frisbee, reading french literature, poetry writing, etc. I set goals for myself for each semester and accomplished them. My big art-related goal was to have my own gallery showing in Hofstra’s Calkins building, which I did my junior year with crayons littering the floor, Franzia consumed in animal-themed paper cups, and Blow Pops served along with the required hummus and celery sticks. Having checked that off, I thought that painting would be something I would pick up again naturally after college, maybe even trying to sell paintings in a local coffee shop. With a job comes the beginnings of a career, and with that comes networking, conferences, speaking gigs, freelance work, finding a second job, getting a promotion, and working all hours of the day, weekend, and holidays to get projects done. Painting was something I only did for special occasions, such as gifts for my niece and nephew (and future niece/nephew). Being in New York and surrounded by artists and culture, it was intimidating to think I could start anywhere. It was always something I wished I had more time to do and would tell anyone such. That’s what led to one of the best presents and biggest awakenings I’ve ever received. My boyfriend Eric rented out an artists’ studio near my apartment for the month of January for me to use as a place to paint. I went there whenever I could and was able to complete three small paintings during that time. Clearly, painting was something I talked about so often that my significant other knew it was something I needed to do – so why wasn’t I doing it more often? Because I never had “time”, or I was tired from work. As more time went on, the more time passed since I last painted, or just tried to paint. 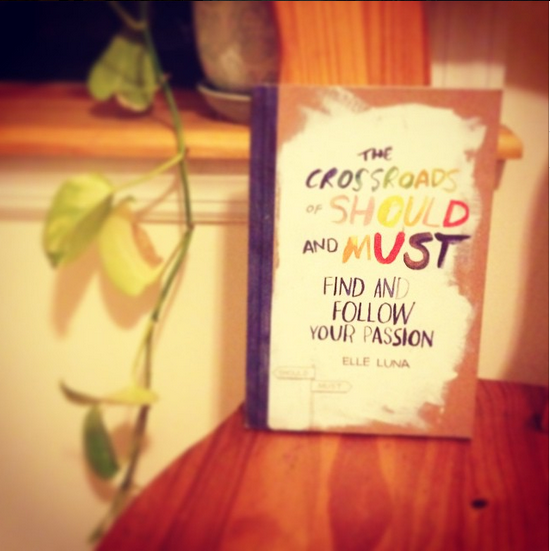 For my birthday a few weeks ago, Jess gave me Elle Luna’s The Crossroads of Should and Must, based on an essay she published on Medium last year. In the book, Luna describes a “must” that everyone has, but doesn’t always pursue because other “shoulds” get in the way. For me, that was certainly painting. After reading the book and simmering on it’s contents, I decided to embark on Elle Luna’s and The Great Discontent’s #100DayProject. It started on April 6th, but one can still begin and either catch up or still do 100 days’ worth of creation. For my project specifically, it will be #100HoursofPainting because 1) sometimes once you start painting, you get in the swing of things and three hours pass by, meaning that I could catch up with everyone else and 2) I won’t always be able to carry paints and canvas with me on trips, so I’ll allow myself the chance to get a surplus of painting hours if I know I am traveling or will have a busy work week. It is a big challenge, since I am committing to painting more than I have since I was taking art classes at Hofstra. But if I don’t do something drastic, five more years can pass by with only a handle of paintings produced. Follow along with my project on Instagram through the hashtag #100HoursofPainting and and check out #mynameisreb for other art projects I’ve worked on. Have you embarked on a similar challenge? What’s one thing you used to do that you really wished you made more time for?